College Point is named for St. Paul’s College, a seminary founded in 1835 by Rev. Augustus Muhlenberg. The college closed its doors around 1850, but the name stuck. The village was formerly called Lawrence’s Neck, Tew’s Neck, Flammersberg, Strattonsport and College Point. However, in 1867, when the village was incorporated; the residents chose College Point as the official name. The First Reformed Church, built in 1872. The Schleicher Mansion, dating to 1857. Poppenhusen Library, a Andrew Carnegie library, built in 1904 and recently renovated in 2005. 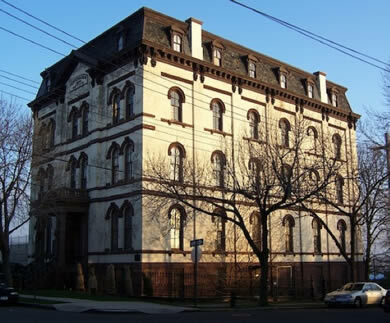 The Poppenhusen Institute, built by the “benefactor of College Point, Conrad Poppenhusen” in 1868. MacNeil Park is one of a number of recreational areas to be found in the village. This, the largest park in College point, was formerly known and still affectionately called Chisholm’s by the locals (after a family that owned a mansion on the park grounds). It later took on it’s present name after Hermon MacNeil, a sculptor whose studio abutted the park. Additional parks include: College Point Park, Powell’s Cove Park, Frank Golden Memorial Park and the Poppenhusen Playground. 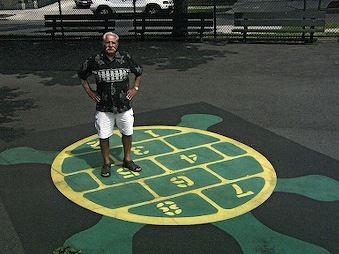 Pictured to the right is Karl, a senior and local volunteer who keeps the 115th Street playground clean and maintained. Philip Haas & Sons Florests on College Point Blvd. has been there for over 100 years. It is still owned and run by the Haas family. The view from MacNeil Park looks out on Manhattan and Laguardia Airport from across Flushing Bay.